What is the largest electric skateboard company in the world? FIIK. Electric boards that go up to 23 miles per hour? Yes. Boards in development to reach double that speed? Yes. Are you interested in learning more? Here’s the story, told by Chris Sears, National Sales & Marketing Manager for FIIK USA. Where does the name Fiik come from? Is that Aussie slang for something we should know? Hahah! Something like that. There are a few claims out there, but officially it stands for Future Is In Knowledge. What is Fiik known for and how long has it been around? 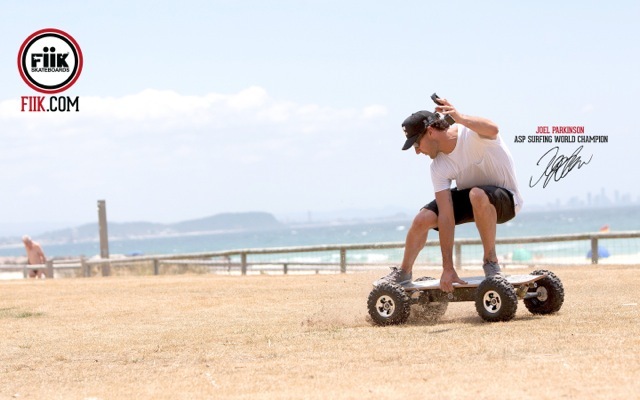 FiiK cut it’s teeth in Australia over ten years ago by introducing unique riding experiences to the market that evolve season to season and push the envelope through our fast and fun electric powered lineup of skateboards, trikes, and other products that I can’t even mention yet! What are some of the significant milestones along the history of Fiik? We made the first off-road electric skateboard and have created partnerships with other companies such as Jeep, Jim Beam, and others. Our lithium battery and brushless motor technology are receiving tremendous editorial coverage in the electronic world. FiiK USA also is the proud recipient of the US Patent for our wireless remote technology. We are the largest electric skateboard company in the world. 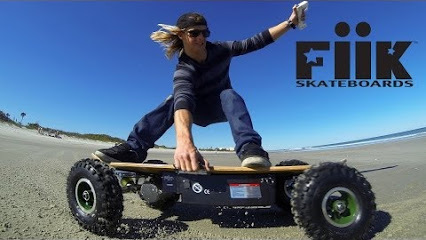 What separates a Fiik board from other electronic skateboards on the market? We believe we offer a powerful lineup of models and price points, depending on the customers budget, riding ability, or age. Our 3 speed models allow the rider to progress in their riding ability up to 23 mph on our current models, but we have a few boards being tested in R&D right now that will go twice as fast. These boards will certainly be targeted for riders looking for speed, agility, and raw power. The establishment of our program for over a decade allows us to incorporate a number of added features like ABS brakes, safety lighting, and proprietary technology that has assisted in FiiK USA being awarded a US Patent. Our owners and designers come from a lifetime of board sports lifestyles and understand how to recreate the feeling of surfing, snowboarding, or bombing a huge hill on a skateboard. Each of our products is built with the need for that feeling in mind. There is no shortage of big names on your team riders list – Joel Parkinson, Bede Durbidge, Owen Wright, just to name a few. How did these guys get involved, was it in the original plan to build your skate team with surfers? What is the connection there? We do have a solid cross section of heavy hitters within the ASP and plan on growing our ambassador list significantly in the coming years. A few of the team riders are mates with the owners and FiiK would sponsor their local charity events in Australia and would get behind many upcoming talents in that market, as they are the future.. We offer a full lineup of normal skateboards and we plan on adding skaters to that team as well as we expand in the US. We are also creating relationships with athletes and icons in other sports, music, and film as we are finding that regardless of your board riding prowess, everyone that jumps on a FiiK board wants in! What is involved in learning how to ride an Fiik board? Can anyone pick it up pretty quickly or is it easiest to catch on, with some previous skate experience? I have seen people from all walks of life jump on a FiiK board in within seconds find their comfort zone and immediately start ripping. People who have previous board riding experience take to the board extremely fast (usually within the first 20 to 30 feet) and are blown away with how much fun they are to ride. It’s been a pretty awesome experience to watch literally 100% of our demos finish with people completely blown away by the riding experience and immediately claim that they want one or want to be a part of our efforts. Fiik is doing great in the Aussie market. How are things coming along with growing Fiik in the US? FiiK Australia is well established with over 300 retailers in their small market, down under. Since the US Patent has been awarded, we have been building a US based sales team of established, seasoned reps to expand our distribution. This past trade show season was a great one for FiiK and we are generating a ton of interest from numerous marquis accounts on both coasts. With a unique product like ours, we are also seeing immediate interest in land locked states with a consumer base that longs for a ‘beach culture’ riding experience that we can provide on so many levels. We are eager to finalize our sales team and create a broad US based family of reps, retailers, and excited brand ambassadors to showcase our ever evolving and unique lineup of products. What can you share about the plan to grow Fiik in the near-term? We have a number of different efforts in the works for the US. From key sponsorship in large concert charity events (Life is Beautiful Concert in Vegas), our growing list of brand ambassadors in varying markets, establishing relationships with marquis accounts in the US. FiiK’s rollout of a number of different product styles, price points, and riding experiences in the coming year that is sure to make FiiK a household name here, much like it has evolved in Australia. What else do we need to know about Fiik?! Our in house team and warranty programs make our consumers feel like family, not a number. We back our products for life and go above and beyond to create the right experience for everyone involved. Once people have a FiiK board in their quiver, they can’t imagine not having one. It’s a great cross training tool as well if you are a surfer or snowboarder as extended ride times are a solid workout on your legs and core.